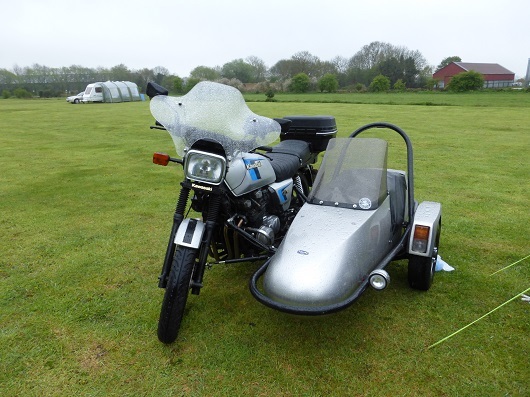 This is the second time I have attended this ride out, and I also meet up with other members of Tri-Anglia Wheels Sidecar Club who have a camping weekend using the campsite next door to the Lincolnshire Aviation Heritage Centre as a base for their Bank Holiday weekend rally. I day-visited on Saturday. Last year the weather was really hot; this year was quite different – the weather was dull, and, to make matters, worse it was quite windy. Luckily the club had a decent-sized tent as a club house, and this proved to be a blessing as it was fairly warm in there. I was told that there was a heavy frost on the Friday night. Luckily the local public house is only a short walk away! 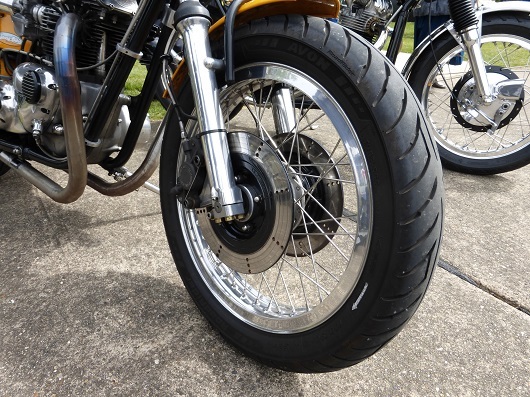 This ride out is organised by the Skellingthorpe and District Motorcycle Club and they have been doing this for the last 8 years, and this year it was held on Saturday May 2nd. 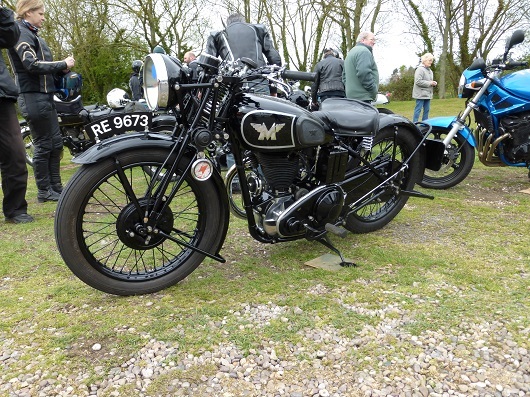 The event starts and finishes at the Heritage Centre, at East Kirkby, not that far from Boston in Lincolnshire. 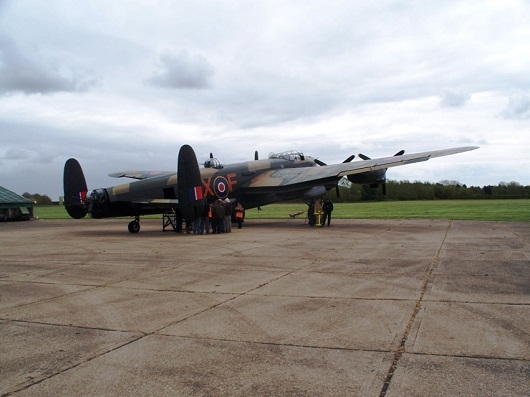 The Heritage Centre is home to “Just Jane” – a real Avro Lancaster aeroplane operating on an orginal Lancaster airfield used during the Second World War. Hopefully “Jane” will return to the skies sometime in the future. 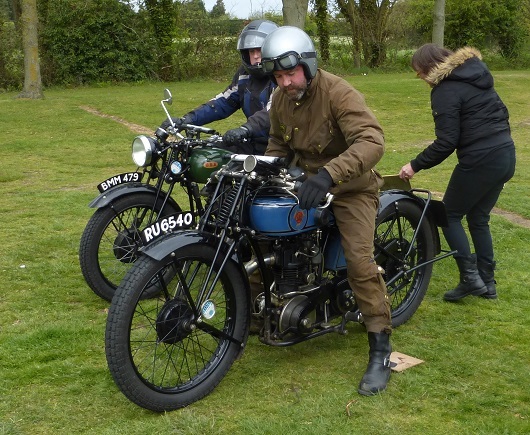 The WW2 Aircraft Museum is open to all riders taking part on the run. 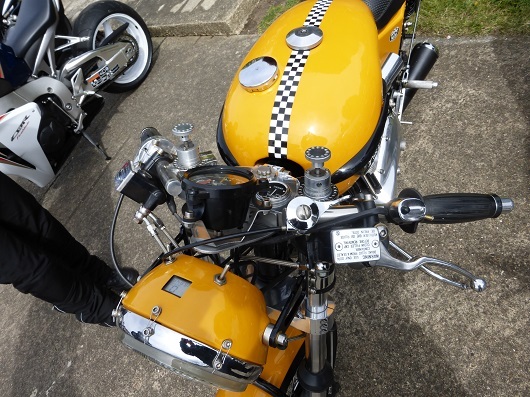 Talking to a member of the organising bike club, she felt that over 500 motorcycles were taking part today. The club had two booking-in sections, one for those who had pre-booked, and the other for those turning up on the day. 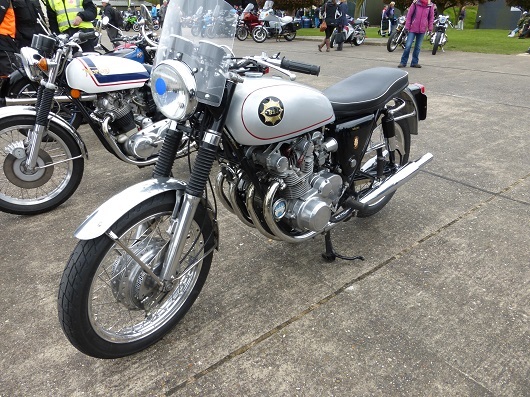 The club was kept pretty busy, with bikes of all ages turning up. 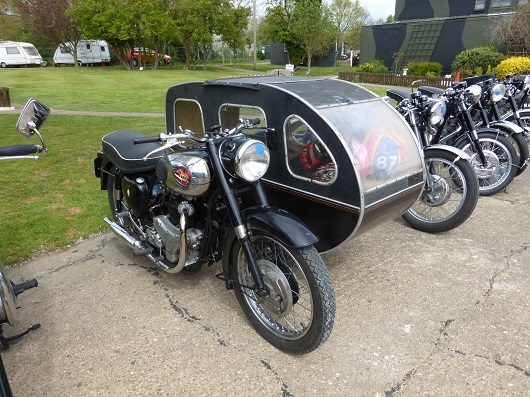 A couple of riders on Velocettes arrived and booked in; one of the riders – a lady – restarted her Velo with ease. 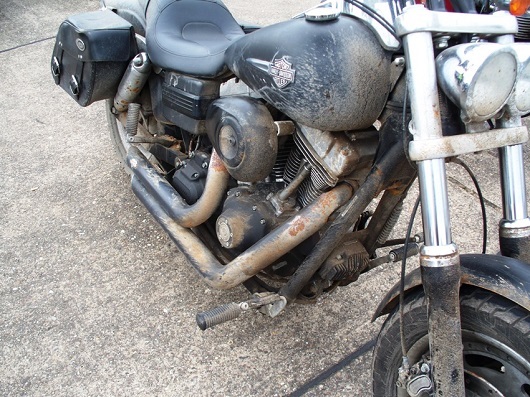 The other rider suffered a bit from comments like if he could not start his bike then the young lady could do it for him!! This is a well organised event. 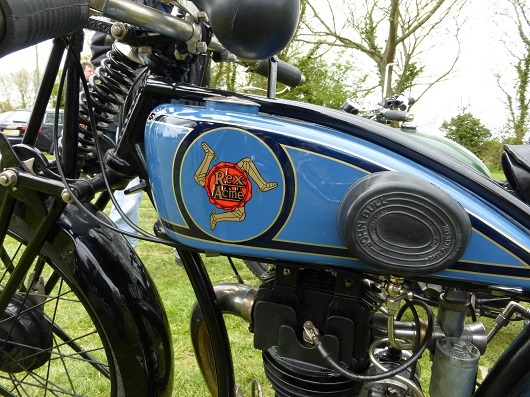 The first group of machines started the run at 10.45 am, for an exhilarating 40 mile ride out through the Wolds; the rest of the riders followed at set intervals. Eleven o’clock saw the Lancaster being fired up for the first of her three taxi runs that day. This was preceded by a warning that when she turns around away from the crowd, the wind from the propellers sweeps the ground clear, so you had to watch out for the dust being blown your way; last year several spectators lost their hats in the breeze! 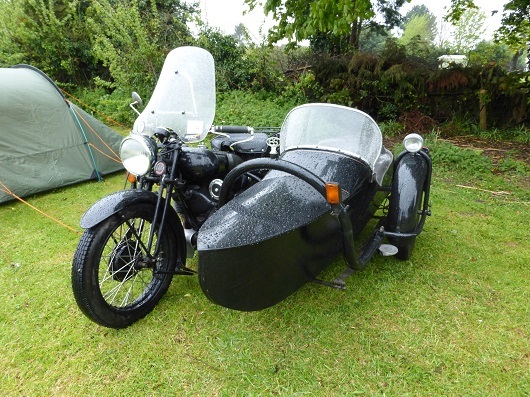 This year the weather was dull, with the occasional burst of sunshine, albeit with a steady breeze blowing, and this kept things decidedly chilly. 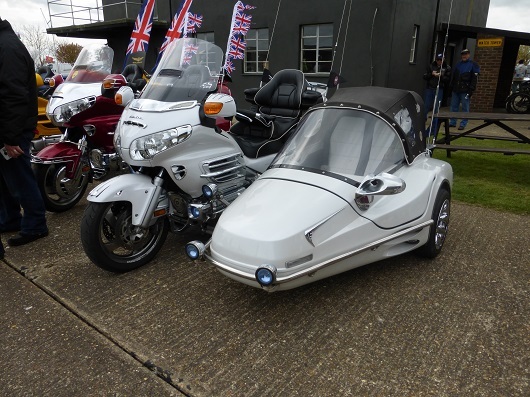 Some members of Tri-Anglia Wheels were wearing several jackets to keep warm, as did most of the stall holders. Fortunately the wind kept the rain away. 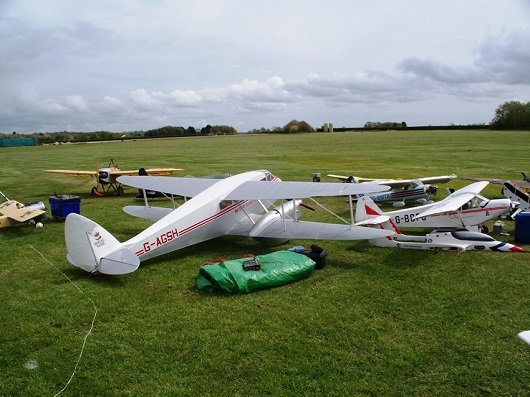 This was lucky because the Large Model Flying Club had their planes in the air most of the day, giving a great flying display. Then, to add to all the goings on, our local, air ambulance flew in did a display and then touched down for a couple of hours. People were able to inspect the chopper and talk to the crew. 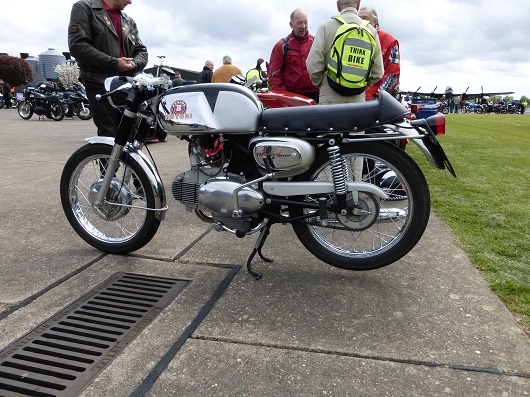 The early riders were starting to return to the airfield, and were shown back to their places by the marshals, who did a great job keeping everything running smoothly. 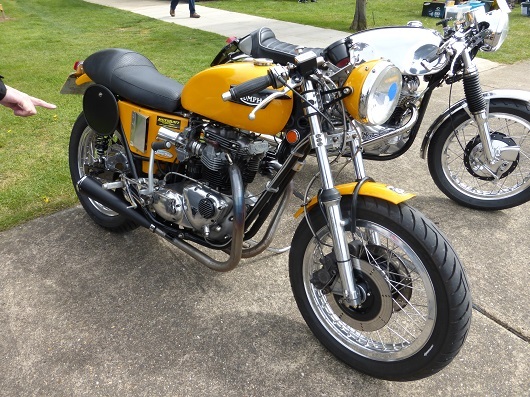 Several machines stood out to me. 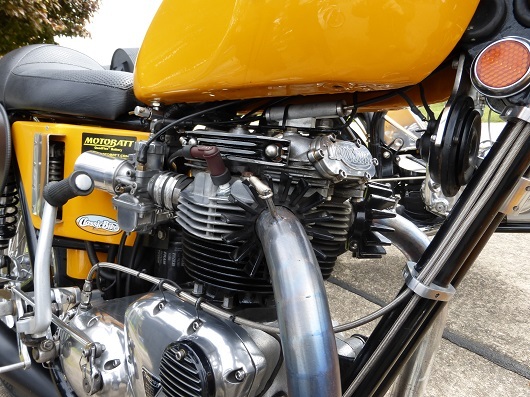 One was an old Norton that the rider left ticking over while he put it up on the rear stand; the tick over was perfect. 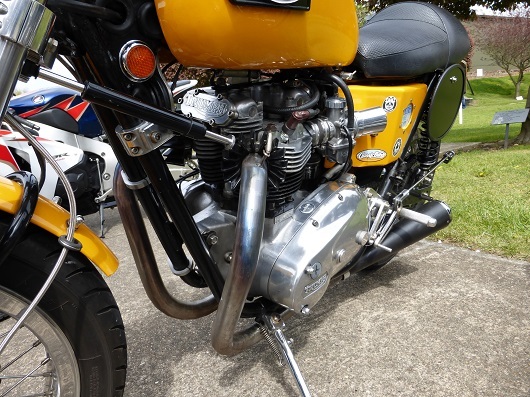 He then climbed back on the bike, selected a gear, and stopped the engine by pressing the back brake. 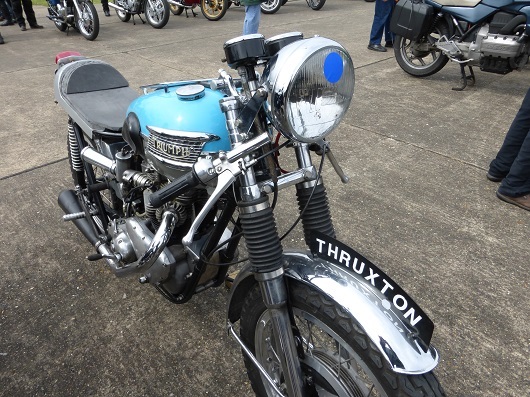 One BSA 4-cylinder lookalike was admired by several riders; they felt that it had been very well done. 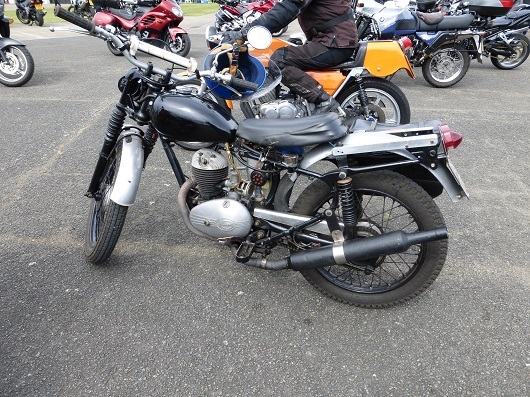 I spotted an AJW Fox motorcycle; this was in nice condition. The silencer was a bit different to the norm. 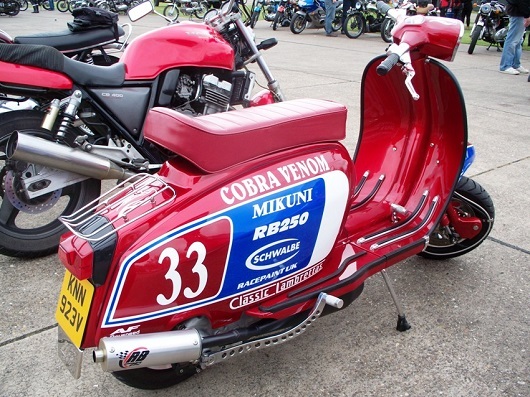 Many years ago I was lucky enough to talk to the manufacturer’s son at a bike show. 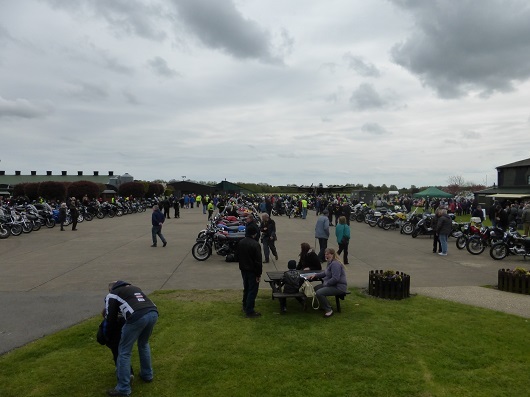 Skellingthorpe and District Motorcycle Club are kindly donating the proceeds of the day to the Lincolnshire and Nottinghamshire Air Ambulance Charity. 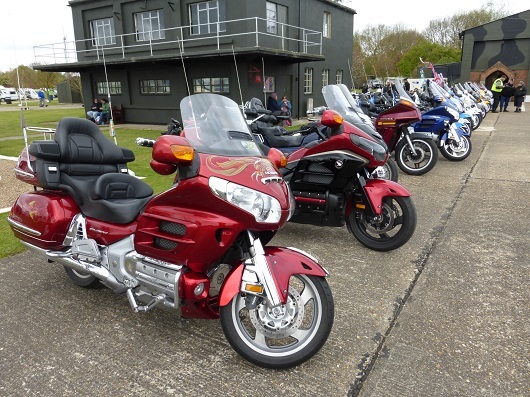 This is a well organised ride out, at a nice venue, with plenty to look at and ample catering facilities. Please note that the Heritage Centre is SHUT on Sundays.